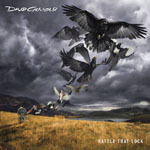 Share the post "Album review: DAVID GILMOUR – Rattle That Lock"
We should be grateful for this latest album from one of rock’s distinguished elder statesman and, who knows, back in 2006 we may have even thought ‘On An Island’ was the ‘swansong’. Like Iron Maiden’s ‘The Book Of Souls’ ‘Rattle That Lock’ is invariably going to be subject to a modicum of hype and, hopefully, a fair degree of critical scrutiny. It is inescapable that this is an album from Pink Floyd’s guitarist but over the 51 minutes the range may be too diverse – and subdued – for other than the most hardened ears. Conceived as a cycle in the average day and opening with the tentative ’5 A.M.’ – all clipped Strat lines and orchestral backwash – it is unsurprising that the title track has been selected as the early single/video as this is easily the most immediate track on the album (a special edition features three variants along with making of footage). However the song isn’t that original, just pleasant, and rattles along like a modern-day variant of Edwyn Collins’ ‘A Girl Like You’. Elsewhere, ‘Faces Of Stone’ has a folky east-European flavour , ‘A Boat Lies Waiting’ comes and goes without consequence and ‘In Any Tongue’ could be a modern day ‘Comfortably Numb’. ‘Beauty’ – one of the album standouts – is similarly Floyd-esque and will tick the relevant box for those who enjoyed ‘Keep Talking’ from ‘A Division Bell’. But it’s all over too soon. We do get another attractive instrumental ‘And Then…’ at the end. ‘The Girl In The Yellow Dress’ puts Gilmour back in the 1950s and a smoky French jazz café and ‘Dancing Right In Front Of Me’ is nice but dull. Gilmour’s partner, Polly Samson, makes a major contribution to his work these days and one wonders whether this is a constraint when matched with his own creativity and vision. Apart from the title track and the soft funk of ‘Today’ (a lighter-weight Blondie ‘Rapture’ ) the album never really lifts off and equally there is a dearth of the much-loved extended guitar sorties that wash over and carry the listener forward. If considered as an adjunct to last year’s ‘The Endless River’ and indeed latter-day Pink Floyd, ‘Rattle That Lock’ is acceptable and welcome. In the pantheon of Gilmour’s solo releases – going back to his 1978 debut – and even compared to ‘On An Island’ - there is an unsettling uneventfulness even if beautifully produced and orchestrated. This entry was posted in ALBUM REVIEWS, ALBUM REVIEWS (Mobile), All Posts and tagged album, David Gilmour, guitar, guitarist, Pink Floyd, prog, progressive, Rattle That Lock, review, rock. Bookmark the permalink.